The advent of animated features and silent films remains one of the most significant accomplishments of the 20th century. Sadly, before celluloid preservation standards were set in place, much of the early studio output of the 1920s was lost or damaged beyond repair. 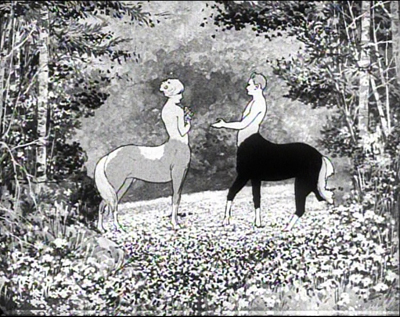 One of those pieces is an animated film, The Centaurs, produced by Windsor McCay in 1921. Of the sole print, which disintegrated due to negligent storage, only about 90 seconds have been salvaged. The animation style is quite beautiful, very influenced by the Art Nouveau motifs of the times, recalling Jugendstil illustrations, like this one, in particular. There is no solid indication available anywhere about McCay’s original intentions for the feature. Was there to be a plot, or did he mean for it to be a romantic, picturesque montage of frolicking centaurs? (Nothing wrong with the latter.) At least we have this little bit to enjoy. A week ago, in a fighting rink hidden behind trees in the middle of San Francisco, I witnessed a grand melee. As dust rose and danced in the July light, a tournament of warriors fought each other for honor and glory. It was an epic battle of worthy and agile opponents: children, grown men and women, and elderly paladins alike. The game stretched on for several hours. 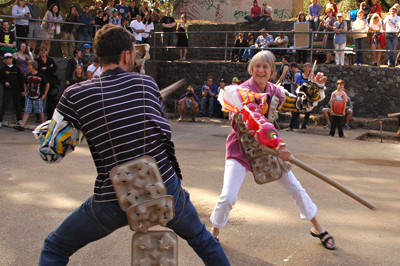 Competitors were eliminated after rounds of bludgeoning each other with swords, their broken weapons littering the ground. If you’re a little bit worried about casualties – don’t bother. The key element to this glorious battle was its weapon of choice – a cardboard tube. “Tube Fighting” is all the rage right now, even though the concept is only two years old, officially. While living in Seattle, a fellow named Robert Easley pondered ways to encourage friends and strangers to go out into the summer sunshine and do something playful, interactive and free. Eventually, he brainstormed the idea of hosting a melee with cardboard swords. Since its inception, the game has grown into a large-scale network, with official chapters in cities like San Francisco and Sydney, as well as scores of unaffiliated gatherings taking place globally every summer. The rules of the game are simple –show up to the meeting spot and sign up on the list to be matched with a friend, or stranger, in battle. Regulation cardboard tubes are available for free if you are participating in one of the events organized by an official chapter. Otherwise, bring your own. The objective is to so thoroughly batter your opponent’s cardboard tube that it will break, thus disqualifying your competitor from advancing into the next round. Nobody actually hits each other – it’s their tubes that take all the beating. 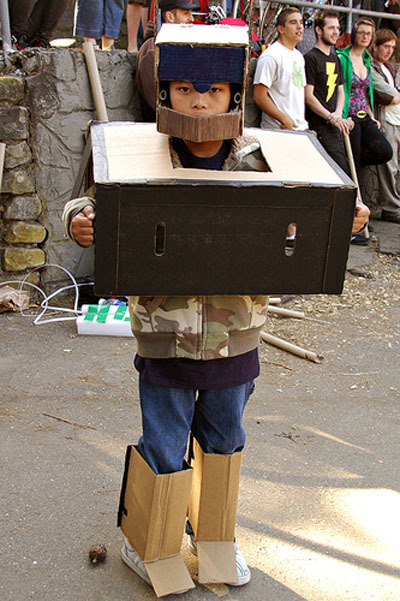 Besides being a fun and cathartic form of stress release –drawing a large audience cheering from the sidelines– the tournament also encourages creativity, as many people make elaborate armor and helmets out of cardboard. 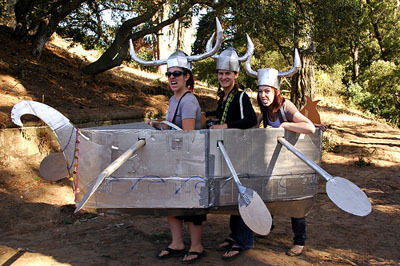 Nothing is quite like the sight of a trio of Vikings in a cardboard ship being chased by a cardboard-headed robot, or a 5 year old girl pumping her fists in the air victoriously after winning yet another round of the tournament. Tube Vikings Kristin, Layla and Jinny. For official rules, check out tubeduel.com. If a League game isn’t officially scheduled in your home city, why not start your own? Just get some cardboard tubes, invite some friends and head out to a park or city square. (Make sure to double check regulations about large gatherings, before arranging a melee, of course). These photos from a week ago may prove inspirational. More photos from Tanya’s outing after the jump. Not to be missed! The sound of snow crunching under treading feet has a soothing quality. There’s nothing quite like the rhythm of little ice particles crushed by an eager boot. Concentrate on the sound for a long while, and eventually it becomes a small symphony of pressures, tones and pauses. Cheryl E. Leonard understands this. Recently, the San Francisco-based musician and naturalist received a grant from the National Science Foundation to go to Antarctica and develop musical compositions based on the natural elements and sounds of that cold, vast region. Musical explorer Cheryl E. Leonard. 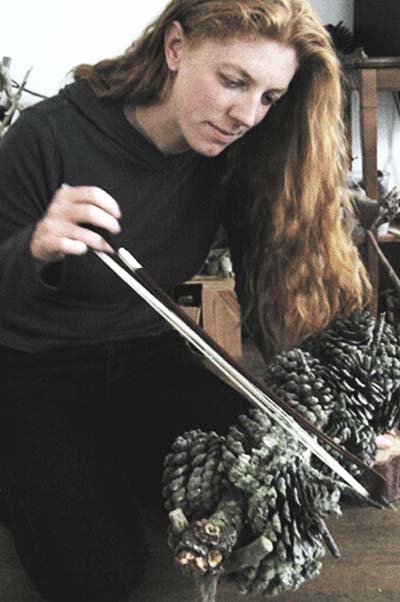 Cheryl Leonard is an outdoorsy type who composes intricate, complex music using instruments created by Mother Nature – rocks, twigs, pools of water, dried seedpods and sifting sand. A graduate of Mills College and frequent collaborator with many talented experimental musicians and collectives like 23Five, she’s one of several local noisemakers profiled in the recent documentary Noisy People. 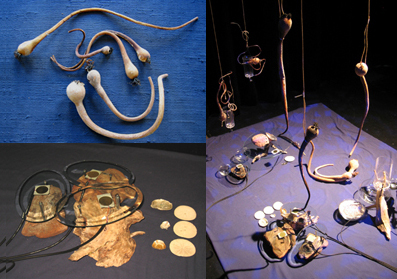 Instruments from the Tides:Estuary collaboration between Cheryl E. Leonard and visual artist Rebecca Haseltine. Paying attention to the smallest details is what makes Leonard’s compositions so remarkable. In a video profile on KQED’s series Spark, (a must-see glimpse into the composer’s creative process) she said: “You could just bang on rocks and it could sound like nothing. It’s how you bang on the rocks that makes it musical or not.” Each instrument, foraged by Leonard through her hikes in the wilderness, is chosen with utmost care and affection. A small pine cone is considered a soprano or alto depending on the sound its scales make when plucked and bowed; a dried strip of bark can become a bow or an instrument on its own; rocks of varying sizes and shapes are all given names and taken home to be rubbed against each other slowly and carefully, or to collide together with gentle, percussive force. Imagine a Paris of the future, as envisioned by someone in the 60s. 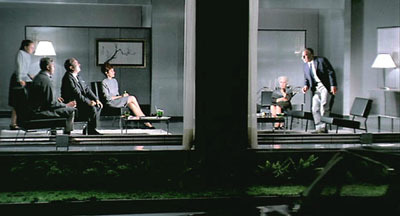 The city landscape is a series of towering glass and concrete constructions, filled with uninviting black, vinyl modernist furniture and efficient businessmen wearing indistinguishable dark suits. The only glimpse of the remaining romantic image of Paris is a ghostly reflection of the Eiffel Tower in the polished glass door of a high-rise building. Offices are operated by incomprehensible switchboard systems that would have made HAL bewildered; trade shows supply visitors with identical looking furnishings and pointless implements of efficiency, like doors that can be slammed without making a sound, or trash cans shaped like Grecian columns; and every apartment, airport, building lobby and street corner looks exactly the same. 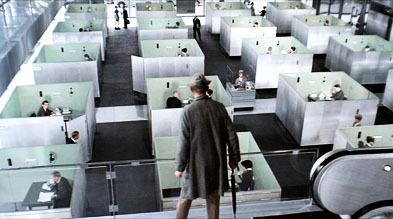 Somehow, director Jacques Tati managed to fill this drab, colorless world with an assortment of characters and plot turns, creating one the most lighthearted and whimsical spectacles I’ve seen in a long while. In 1967, Tati wrapped up three years of filming (including 9 months of editing) of Play Time, his third film featuring an endearingly bumbling character named Monsieur Hulot, played by the director himself. The movie was a grand undertaking shot entirely in 70mm, with elaborately constructed sets and a stereophonic soundtrack that was quite advanced for the time. It was also a tremendous financial flop that sent Tati into bankruptcy. The best way to go into the film is without expectations, only to come out smiling. The title is appropriate – the movie is a farce, but such a sweet and kind-hearted one, playful yet extremely stylized. Any plot description, long or short, won’t convey the effects of the meticulous character choreography, the clever visual humor, or the deliciously crisp audio track. However, Play Time’s basic synopsis is such: through a series of coincidental interactions, two bewildered characters (Hulot, with his too-short pants and smoking pipe, and a young American woman traveling with a guided tour group) barely cross paths, while trying to navigate the confusing maze of downtown Paris. The two finally meet at a new restaurant – so new, in fact, that the construction workers are still building parts while the hosts welcome their first diners to the grand opening. Everything that could go wrong, does, and the result is a chaotic, tremendous, swinging party that would have made Peter Sellers well up with pride.